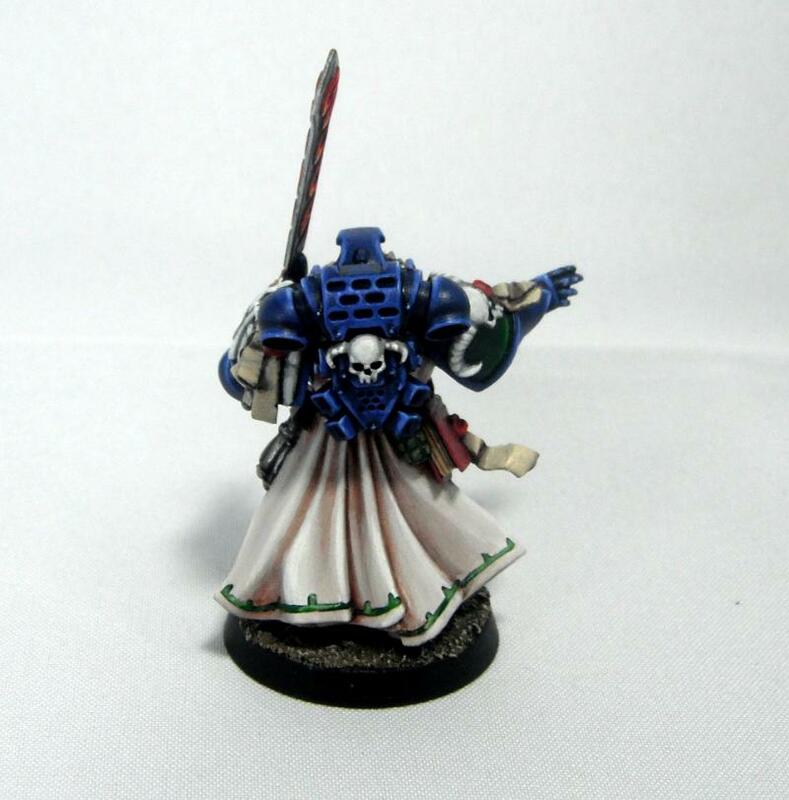 I’m gradually getting through my Dark Vengeance models. 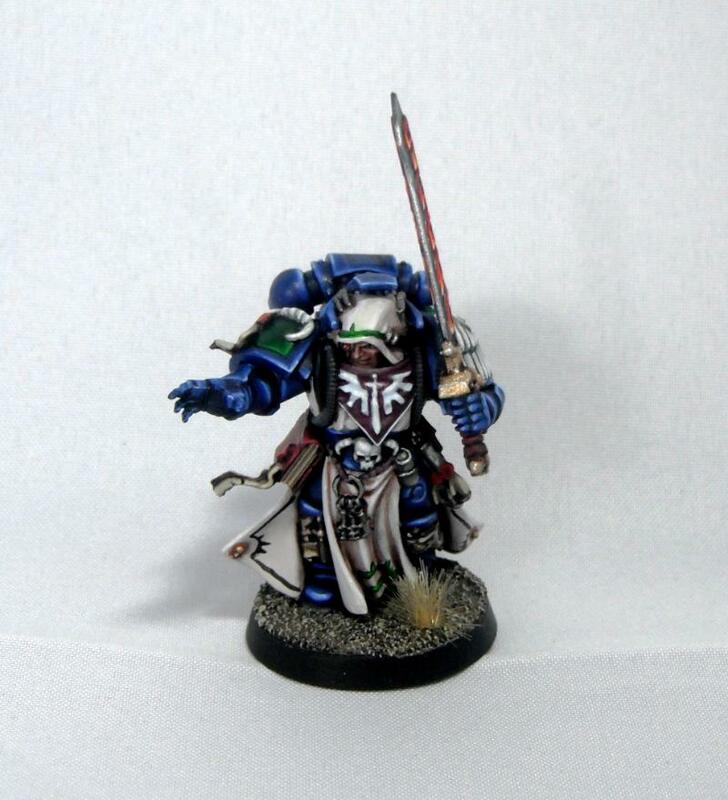 Here is my version of Azrael converted from Master Balthazar from the set. 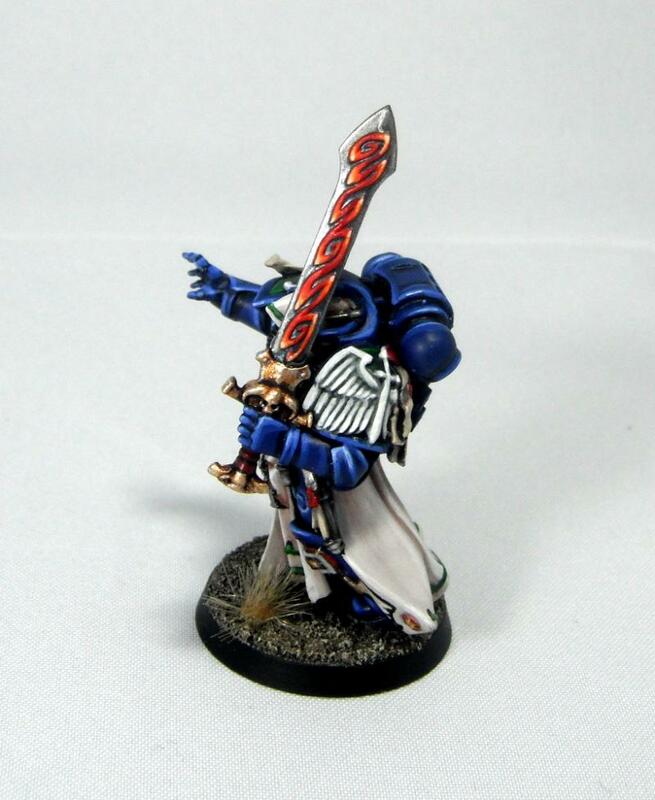 This was a very simple head swap as Balthazar has the same equipment as Azrael. 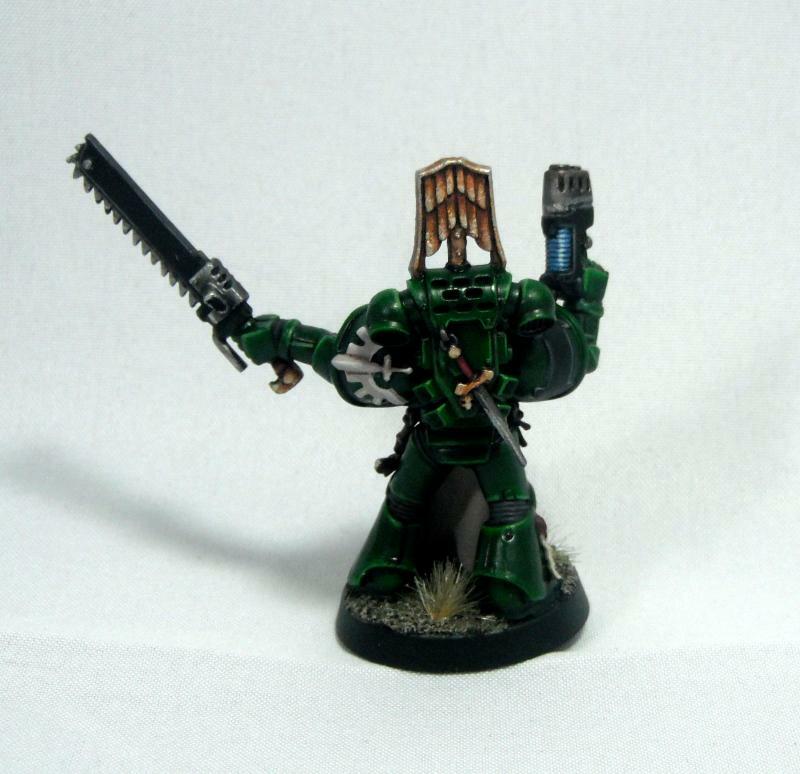 I chose the bare head from the Devastator box as it looks very similar to Azrael. 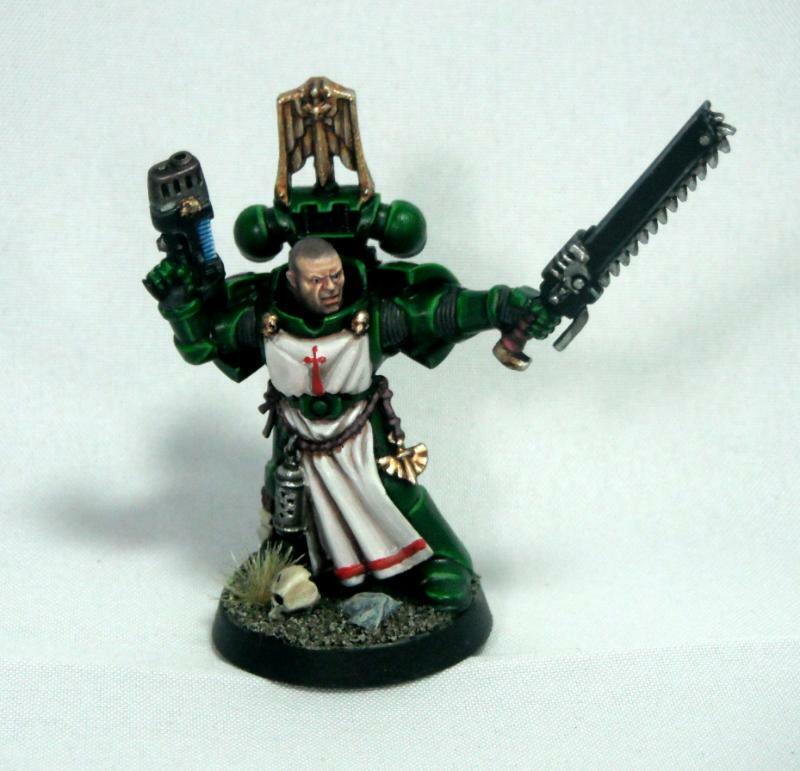 Although I like the original Azrael model it is now looking a bit dated and doesn’t really fit in with the current look of the Dark Angels chapter which has become more ornate over the years. 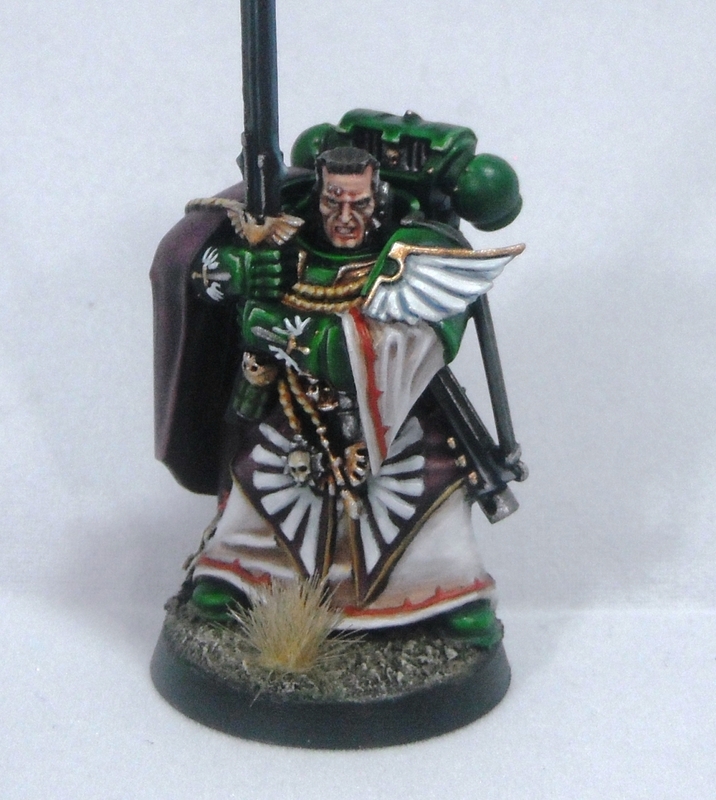 I’ve finished Squad Barachiel from Dark Vengeance. For more information on the painting process see this post. 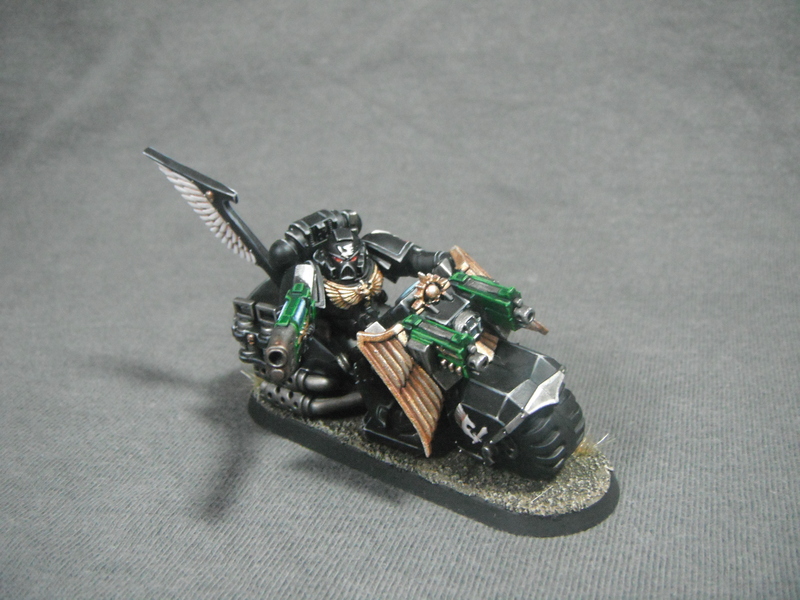 I have finished the first model of my Ravenwing squad. 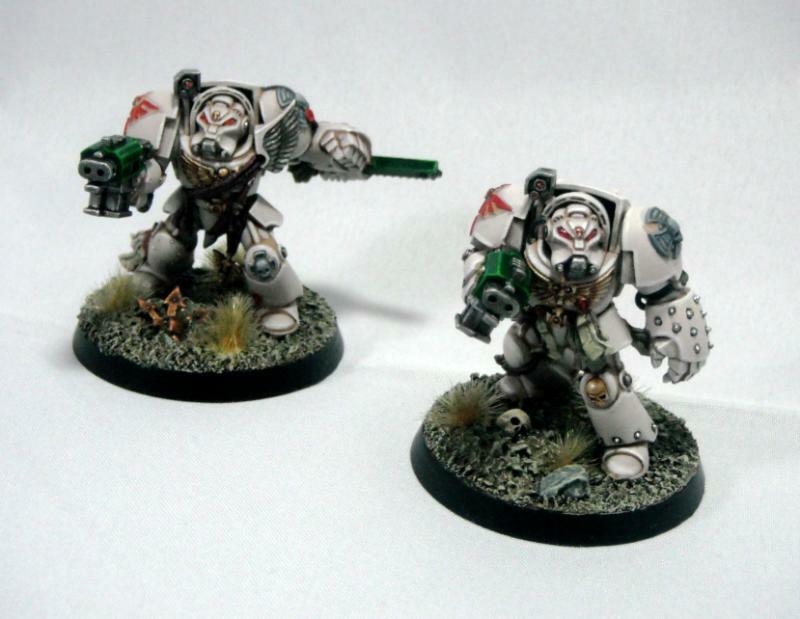 As with my Deathwing terminators, I took special care with the Ravenwing to make sure that they are consistent with the rest of the army. Details such as the gold, eye lenses, scroll work and purity seals are painted the same way as on all of my other Dark Angels and the gun casings are painted in green to tie in with the tactical marines. 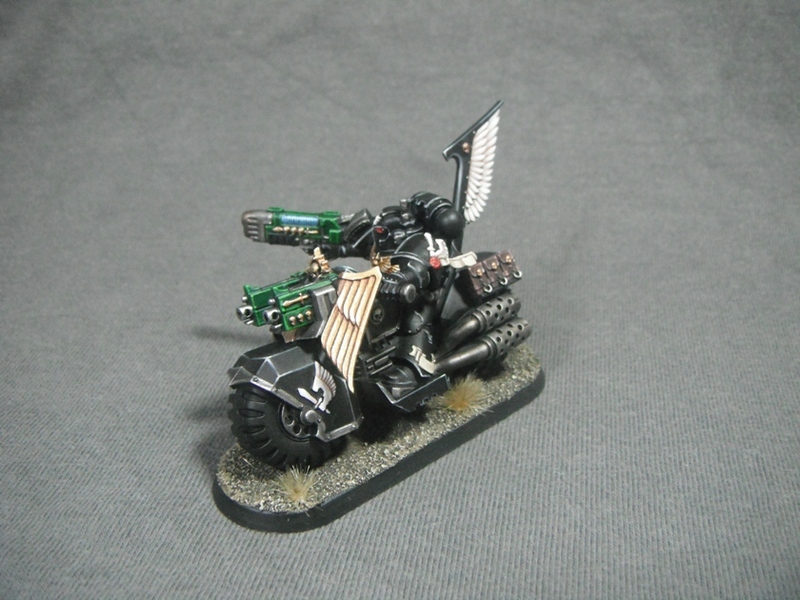 In addition to this, the ‘feathers’ on the back of the bike are painted using the same palette as on the Deathwing armour. Just a quick update to show my progress on the Dark Vengeance set. When I showed these photos on Twitter I got an overwhelming response so I thought it was worth posting them here with a slightly more detailed write up. 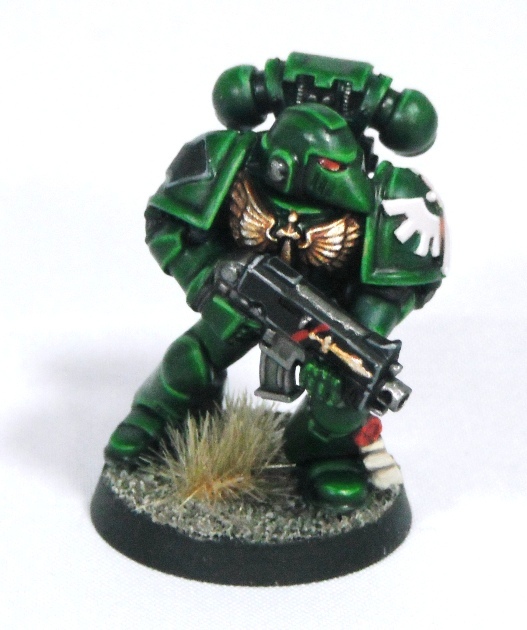 A lot of people have asked me how I painted my Dark Angels so here is a break down of the paints I used. In order to maintain a dark look overall I kept the majority of the armour dark green and applied extreme highlights only to the very edges of the armour (in a similar way to the ‘Eavy Metal team’s Dark Eldar). 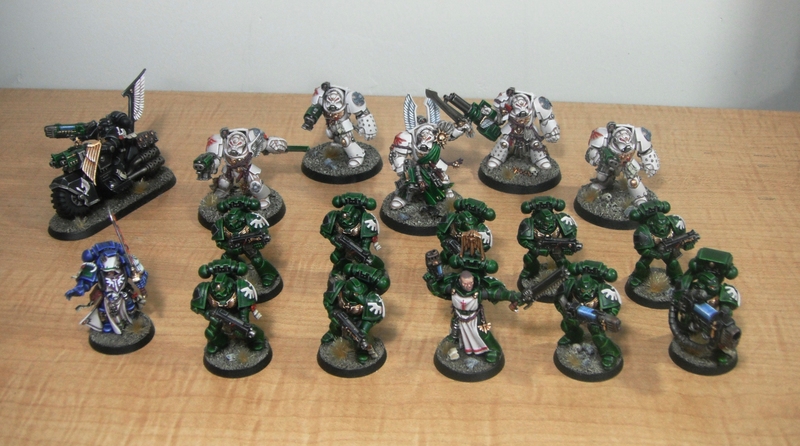 All of the Tactical Marines started with a black undercoat. 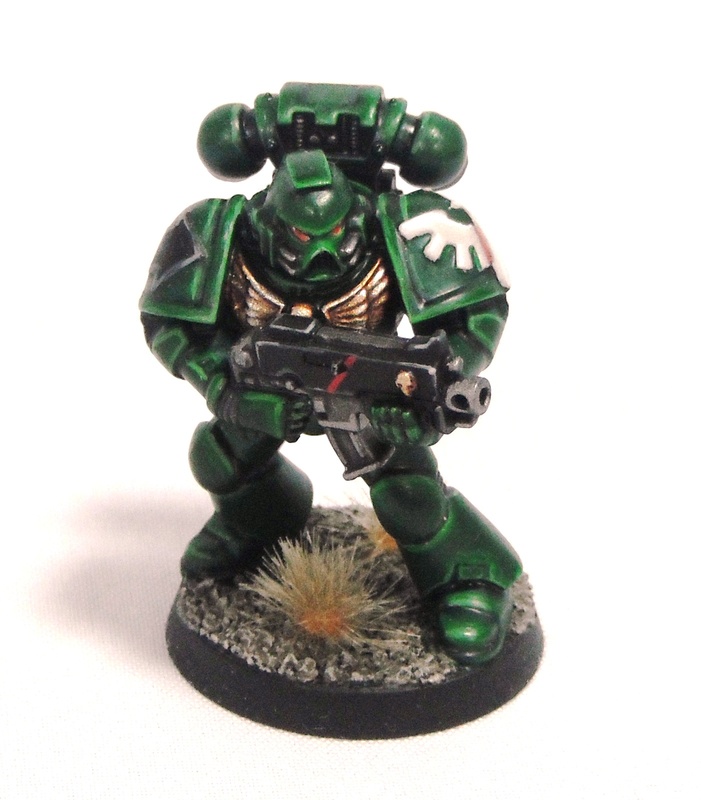 1) Basecoat Dark Angels Green (it took about 3 coats to get a smooth, even finish). 3) Highlight 50/50 mix Snot Green and Goblin Green. 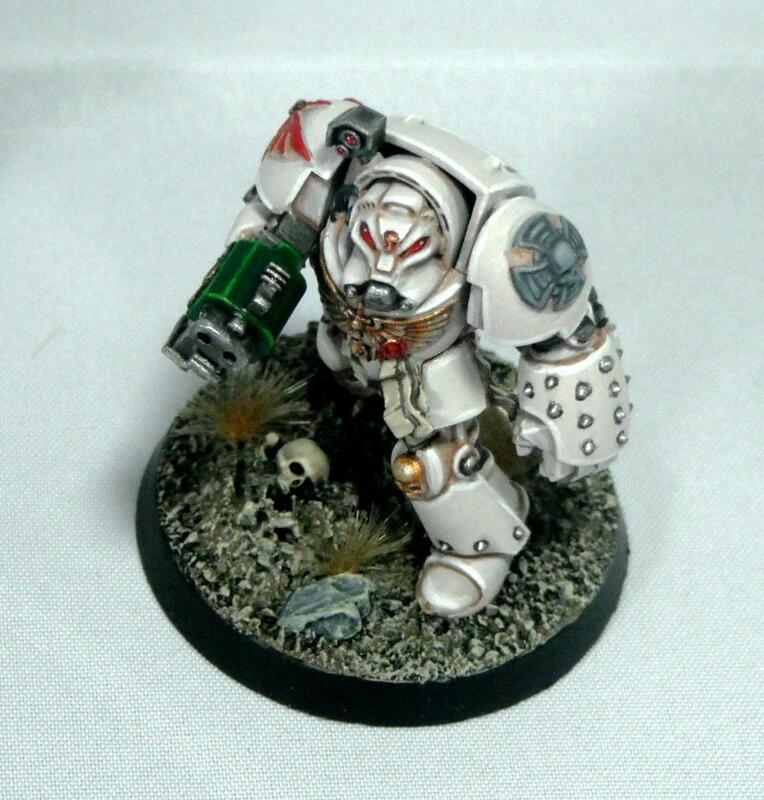 5)Apply very tiny highlights to the helmets/face using Rotting Flesh. The idea behind the final highlights of Rotting Flesh is to subtly draw the eye to the model’s face and make it stand out more. 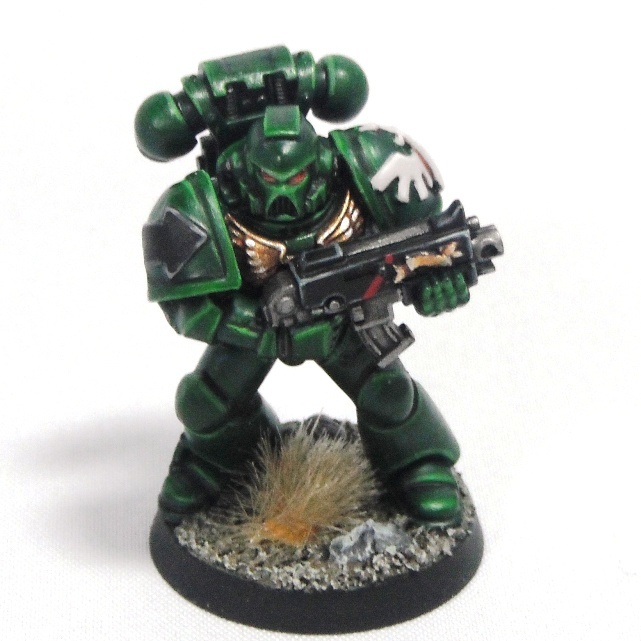 This gives the Dark Angels a focal point which they would otherwise lack as the helmets are the same colour as the rest of the armour. 2) Shade with thinned Dark Flesh followed by Scorched Brown in the deepest recesses. 3) Highlight with Tallarn Flesh with increasing amounts of Elf Flesh added. 4) Apply a final highlight by adding Bleached Bone into the previous flesh mix. 5) Paint the lips Tanned Flesh. The stubble technique was taken from the excellent ‘Painting Faces Redux’ article from White Dwarf 356 which can also be found on the White Dwarf archive (see link). One thing I would recommend is adding some Lahmia Medium to the wash in order to give you more control over the flow. You want the wash to be translucent so that the flesh colour still shows though and the medium is great for this. Hopefully more Dark Vengeance goodness to follow later in the week. If you follow me on Twitter you will know that recently I was lucky enough to win a copy of the Dark Vengeance set. 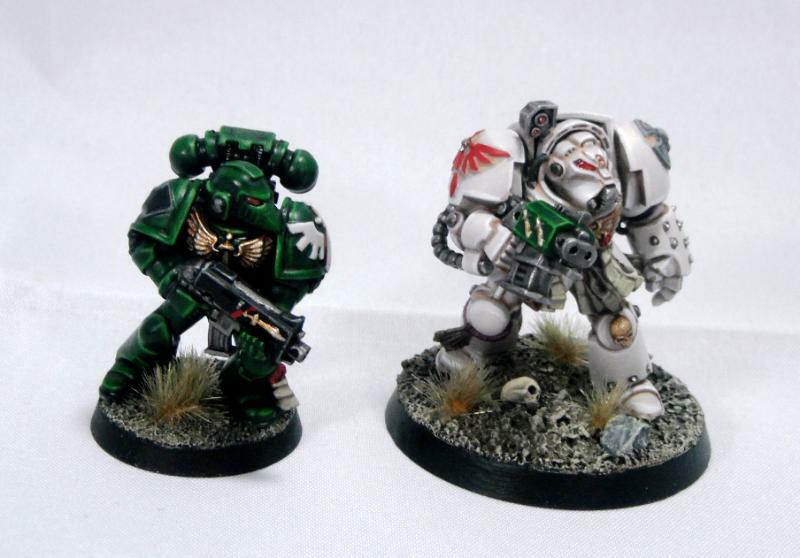 Here are the first models I painted from the set, a Dark Angel tactical squad. I batch painted these models following an ‘ Ask ‘Eavy Metal’ article from White Dwarf 369 (it’s actually a guide for Disciples of Caliban but the colours are more or less the same). 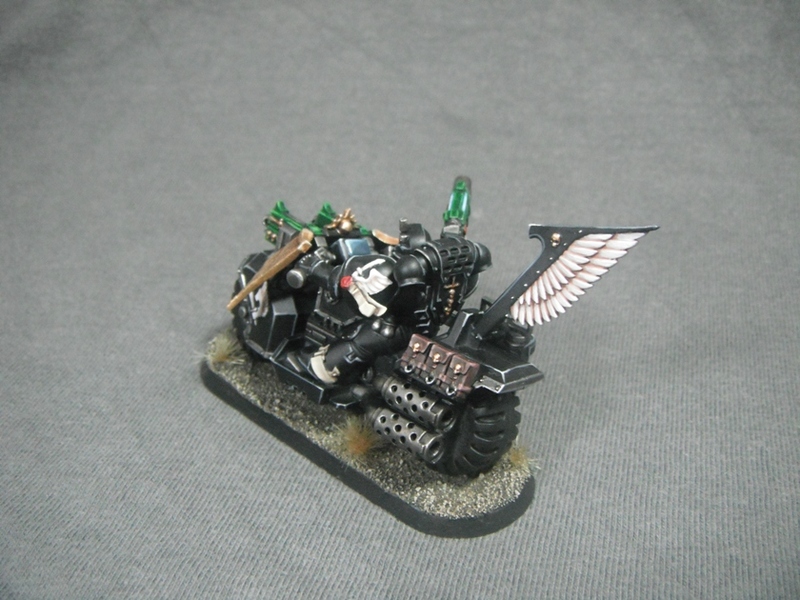 I wanted to put the ‘dark’ into Dark Angels avoid the ‘Christmas tree’ colour palette that you often see used for the chapter. 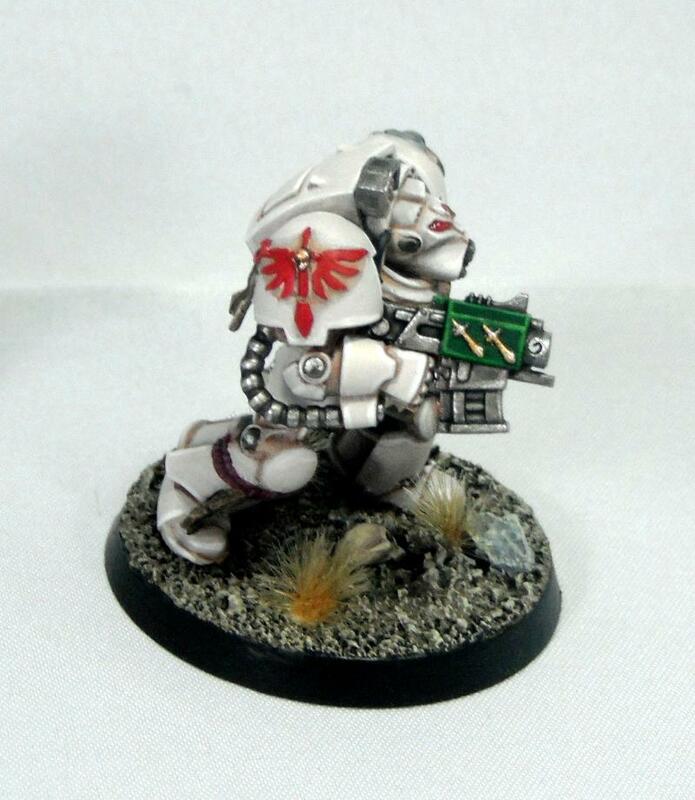 To that end I only made very limited use of red and cream on the models in order to keep the overall look darker. 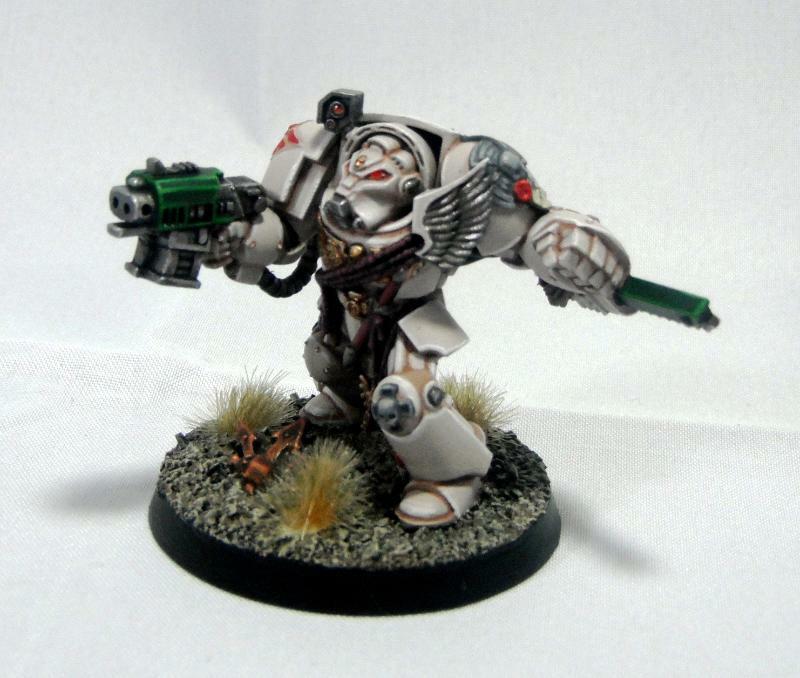 For this reason I painted the tactical markings in black rather than red or white (both of which I tried but looked too bright). I’m aiming for a high tabletop standard with these as they will be for playing and not just for display. At the moment I consider them finished but I may go back and add some 5th company markings and squad numbers once I have some more of the set painted. As you may have noticed, sergeant Raphael is missing from the photo. I batch painted him along with the rest of the squad but, because of the extra details not present on the other models, I put him to one side after painting the green armour and will finish him at a later date.